Mummy is having a baby . . . I've got a daddy and a big brother, but we haven't had a baby before. 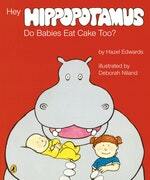 So I told my hippopotamus who lives on the roof and eats cake. He knows everything about babies. Love Hey Hippopotamus, Do Babies Eat Cake Too?? Subscribe to Read More to find out about similar books.